Our friend Jeff came to visit for the weekend. He loves to cook, so we planned on cooking all day Saturday. First, we made a big bowl of my pico de gallo - what a treat in January!! My corn chowder with jalapeno cream was for lunch - a quick and easy soup. For dinner we had grilled filet mignon with caramelized onion and spinach risotto. Jeff made a great salad that we enjoyed with dinner - Grilled Ciabatta Bread Salad. He found the original recipe, a Bobby Flay recipe, on the Food Network web site. It's no longer listed on this site, but this recipe is an adaptation of the original. Slice bread into two long halves; spray with cooking spray and grill until charred. Jeff says to grill it as dark as you can take it! Chop the bread into 1 inch pieces and add to onions and cilantro with another 1/2 c olive oil. Chill at least one-half hour. Add tomatoes, spinach, cheese. Toss with balsamic (start slowly, add to taste) and salt/pepper/oregano to taste. This salad was so delicious and refreshing. 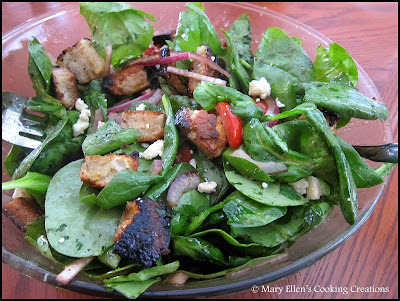 I loved how all of the flavors worked together, and there is nothing like grilled bread in a cold salad. We all loved the flavor that the blue cheese added, and think it was a perfect substitution for feta. This looks great! Definitely bookmarking! WOW! What amazing food photography! You put me to shame. I love your recipes and am so thrilled that you found my blog and shared your enthusiasm. Nice to find another Philly Food Blogger. Are you a photographer too? I'm strictly an amateur, but am eager to learn more. What's your cooking background? You have great skills, you must have some lessons or professional work in your past. Hope to meet you sometime around Philly! I think I had seconds and thirds when you made this salad last time! I just made it myself... the Italian market was all out of ciabatta so I'm using "Roma Bread" which is similar to ciabatta. The cheese shop was out of feta so I'm using Ricotta Salata. The salad still has that addictive taste I was craving. MMM!